One of the more enigmatic queens of England, we know precious little about her and her personal feelings. Was she a pawn in the strategies of her father and her husband? Or was she ambitious and a schemer? Did she know of her husband’s plans for taking the throne of England? 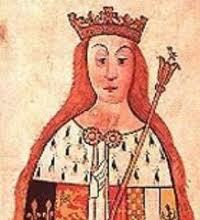 Anne Neville was born on June 11, 1456 at Warwick Castle. She was the younger of two daughters of Richard Neville, sixteenth Earl of Warwick and sixth earl of Salisbury who would later become known as the Kingmaker. Her mother was Anne Beauchamp, heiress to both the earldom of Warwick and to the Despenser properties, a vast inheritance. Anne and her sister Isabel were the paramount heiresses of their day. Anne probably had her own establishment growing up, possibly as an extension of her sister’s household. The two girls would have been taught the essentials of becoming a medieval wife and mother such as etiquette, how to read, accounting, how to handle servants, how to weave and sew. During Anne’s first year, her father was appointed to the position of Captain of Calais and moved there. The rest of his family may have also moved to Calais or Anne and her sister possibly stayed in England. If they lived in England, they would have lived primarily at Warwick Castle with occasional stays in their father’s northern castles. We don’t know what Anne looked like but the chronicler Rous who knew her personally described her as beautiful, amiable, virtuous and gracious. Richard Neville helped Edward, Earl of March win the battle of Towton on March 29, 1461. It was a Yorkist victory over the Lancastrian forces of King Henry VI who fled to exile in Scotland with his queen, Margaret of Anjou putting themselves under the protection of the regent Mary of Guelders. The new king Edward IV appointed Anne’s father to the positions of Admiral of England and King’s Lieutenant in the North. The entire Warwick family was united, moving into the castle of Middleham in Yorkshire. Sometime between 1461 and 1464, Richard, Duke of Gloucester, younger brother of the king, joined the Warwick household to learn chivalry and for military training. Anne and Richard would certainly have known each other from this time. Anne is on record as attending many important events during the 1460’s. She was present at the reburial of the remains of her grandfather, Richard Neville, earl of Salisbury at Bisham Abbey in 1463. Anne, her sister and Richard of Gloucester are recorded as attending the enthronement of their uncle George Neville as Archbishop of York in September 1464 at Cawood Castle and of joining in the feast afterwards. In February of 1466, Anne’s family appeared at the christening of King Edward’s eldest child, Elizabeth of York and at the wedding feast of King Edward’s sister Margaret of York in 1468. By February of 1469, Richard of Gloucester had left the Neville household to take up duties for his brother. In 1465, King Henry VI was captured and incarcerated in the Tower of London. As early as 1464, Anne’s father may have considered marrying his daughters to the King’s two younger brothers, George, Duke of Clarence and Richard. Possibly over the objections of the king, Anne’s sister Isabel was married to George on July 11, 1469 at Calais. Shortly after this, King Edward and Anne’s father became estranged. Warwick and his son-in-law decided to rebel against King Edward IV. They mustered troops but the King had superior forces. Realizing they would be unsuccessful, Warwick fled to Calais with his family, including Anne and her sister Isabel who was pregnant. They were denied entry to Calais and Isabel was forced to give birth on the ship. The child died. They finally landed in Normandy and began their exile. Warwick met with King Louis XI of France who took him to meet his wife Charlotte of Savoy after which important talks were conducted. Louis and Warwick decided to join forces with Queen Margaret of Anjou and her son Prince Edward of Lancaster to put King Henry VI back on the throne of England. It is unclear if Louis or Warwick promoted the marriage of Anne with Prince Edward as part of the deal. Margaret had a significant amount of distrust of Anne’s father making her skeptical of a marriage between her son and Anne. However, the match was arranged and on July 25, 1470, Anne and Edward were officially betrothed in Angers Cathedral. In attendance were King Louis, King Rene of Anjou, Margaret of Anjou, Anne’s sister and her parents. Because the couple were related in the fourth degree of consanguinity, they needed the proper dispensation from the Pope. In order to speed up the process, Louis took out a loan to bribe the proper officials in the Vatican and in the meantime, Anne was turned over to the care of Queen Margaret. On July 31, 1470, Anne and the Prince left Angers for Amboise while her father and Margaret plotted to invade England. Warwick wanted Anne’s marriage to take place before he left for England but the dispensation did not arrive in time. Louis promised to treat Anne as royalty until the marriage was finalized. The dispensation still had not arrived by November. Louis was exasperated and sent the Grand Vicar of Bayeux to get a dispensation from the Eastern Orthodox Patriarch of Jerusalem. By early December, the paperwork had arrived. The wedding was celebrated in the royal chapel of Amboise on December 13 officiated by the Vicar. In attendance were many members of the royal houses of France and Anjou along with the Duke of Clarence. Sixteen year old Prince Edward had a penchant for war and violence and a great desire for revenge upon his family’s enemies. We have no idea how Anne and Edward felt about each other. Queen Margaret may have forbidden her son to consummate the marriage, just in case her mission to regain the English throne was unsuccessful. The Prince could then have the marriage annulled and a new more suitable match made. The day after the wedding, Margaret, with Anne in her retinue set out for London stopping in Paris to spend Christmas. In the meantime, Warwick departed for England with troops supplied and paid for by Louis. Warwick provided a reason for King Edward to leave London by having his brother-in-law start an uprising in the north. Edward took the bait. On October 3, Warwick released King Henry VI from the Tower and proclaimed him king, parading him through the streets. King Edward fled, along with his brother Richard to Burgundy, where their sister Margaret, Duchess of Burgundy gave them refuge. Queen Margaret heard the news but delayed returning to England until March. Edward IV had returned to England and engaged Warwick in battle at Barnet on April 14, 1471. Warwick was killed. That same day, Queen Margaret, along with Anne, arrived in England. Margaret was persuaded by some of her men to continue the fight. She confronted and engaged the troops of Edward at Tewkesbury on May 4. Her forces were soundly beaten and Prince Edward, Anne’s husband, was killed sometime during or shortly after the battle. Margaret and Anne took refuge in a convent near the site of the battle and were arrested two days later. King Edward was now established on the throne for good. King Henry VI was killed in the Tower in May. On May 11, Anne and Margaret appeared before King Edward at Coventry. Margaret was allowed to go into exile at the home of her father in Anjou. Anne was released in to the custody of her brother-in-law, the Duke of Clarence, living with her sister and Clarence at Coldharbour House in London. It probably became known that Richard was interested in marrying Anne. Clarence was anxious to acquire all of the Warwick inheritance through his wife and therefore would not have been keen on his brother marrying Anne. He may have tried to keep her out of his brother’s sight. Anne would have wanted an ally to maintain the way of life she was accustomed to and to retain her inheritance. Anne wrote to King Edward’s queen, Elizabeth and to her mother Jacquetta of Luxembourg as well as Princess Elizabeth, asking for the right to claim her half of her inheritance through the courts. Her request was denied. 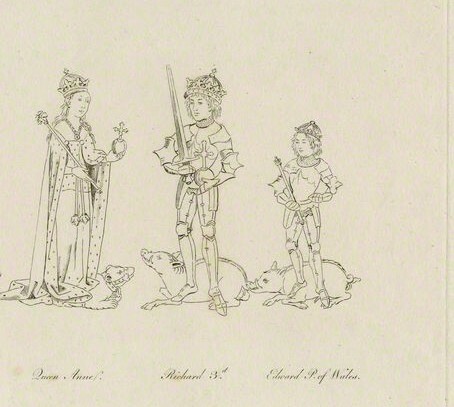 Whatever negotiations occurred between Clarence and Richard over the Warwick inheritance caused an estrangement between the brothers and the sisters. We don’t really know how her marriage to Richard came about. On February 16, 1472, Richard somehow managed to get Anne out of Clarence’s household and into sanctuary at the church of St. Martin-le-Grand and began the process of obtaining Anne’s share of her inheritance. Anne and Richard were married sometime after March of 1472 but no later than July of 1474. 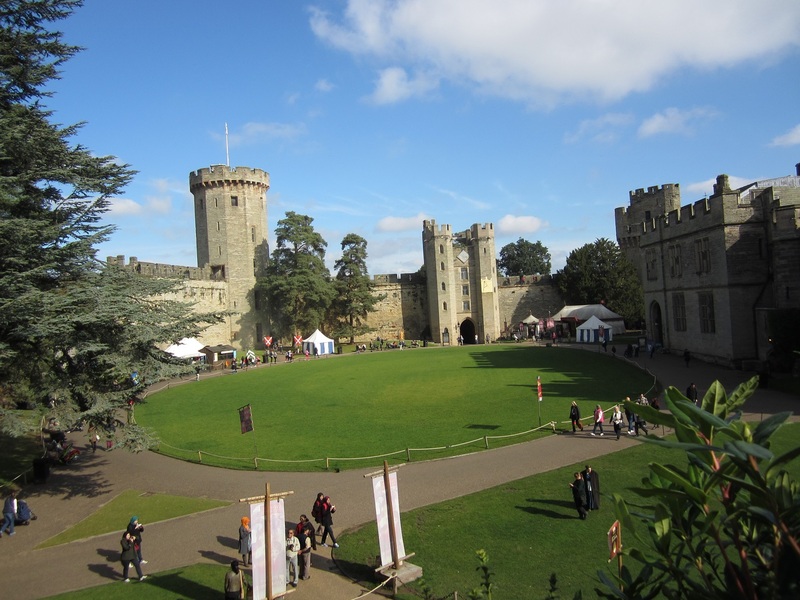 Two acts of Parliament were enacted in 1474-5 which divided the whole Warwick estate by setting aside the rights of Anne’s mother, allowing Anne and Isabel to inherit. Clarence acquired all of the Earl of Warwick’s possessions except the Neville lands in the north which were given to Richard of Gloucester. From the time of their marriage until the spring of 1483, Anne and Richard resided mainly in the north as Duke and Duchess of Gloucester. By identifying with Anne’s kin and subjects in the north, Richard gained their support and loyalty. Anne may have gotten along well with her mother-in-law, Cecily Neville. Sometime between 1473 and 1476, Anne gave birth to a son at Middleham Castle named Edward. In July of 1476, Anne attended the re-interment of Richard’s father and brother at St. Mary the Virgin and All Saints Church in Fotheringhay. King Edward IV died unexpectedly on April 9, 1483. He was buried in St. George’s Chapel at Windsor on April 19 and Richard arranged for a memorial service in York on April 21. Two days later he headed south to London accompanied by troops for the coronation of his nephew Edward V and to take over as Protector. On June 5, Anne arrived in London to join him. By this time secret meetings were being held to discuss Richard becoming king in his nephew’s place. It’s impossible to know if Anne knew of her husband’s plan to take the throne. On June 26, Richard was declared king. The next day orders for royal robes were in place. The first joint coronation in two centuries was planned for July 6. On July 3, Anne and Richard exchanged gifts. He gave her twenty-four yards of purple cloth of gold and seven yards of purple velvet. She gave him twenty yards of purple velvet adorned with garters and roses. They traveled from Baynard’s Castle, the York’s family home, to spend the night in the royal apartments of the Tower of London. On July 5, Anne rode behind Richard through the streets of London in a canopied litter atop two palfreys draped in white damask. The litter was also covered in white damask along with cloth of gold trimmed in ribbons and bells. Anne wore her hair down with a golden circlet set with precious stones and pearls. She wore a kirtle and mantle made of twenty-seven yards of white cloth of gold trimmed with ermine and miniver along with lace and tassels of white silk and Venetian gold with a train of crimson velvet. In front of her were two of her gentlemen ushers and her chamberlain and following her were her henchmen, her horse of state and three carriages carrying twelve noblewomen. The next day Anne and Richard made their way to Westminster Abbey. Anne wore a purple velvet surcoat and mantle covered with rings and tassels of gold and a crimson gown trimmed with ermine. Again her hair was loose and she was barefoot. Anne followed Richard into the Abbey as Margaret Beaufort bore her train behind her. She prostrated herself on the carpeted and cushioned ground. They were both anointed and crowned and then took their place on two thrones set up on a stage. Anne held a scepter and rod and a ring was placed on her right hand fourth finger. Anne was now Queen of England. Mass was celebrated and a banquet was held at Westminster Hall where about three thousand were served. Two weeks later, Anne and Richard went to Windsor where she remained as he went on progress through his new kingdom. Anne joined Richard at Warwick on August 8 where they stayed for a week. They then made their way to York where their son Edward was invested as Prince of Wales in early September. Anne does not appear to have taken part in the mass or the actual investiture but together she and Richard led their son through the streets of York, holding his hand. Anne made her home at Greenwich and settled in there. Most of those who served in her household were members of the northern gentry from the time she was Duchess of Gloucester. In the spring of 1484, Edward IV’s five daughters came to live with her. She also had in her care her sister’s two children, Edward Earl of Warwick and Margaret as both their parents had died. In March of 1484, Anne augmented and endowed Queens’ College Cambridge with rents and gifts from her mother’s properties. By July of 1484, she took on the title of foundress of the college. We know she owned a book, Mechtild of Hakeborn’s “Booke of Gostlye Grave” which she signed “Anne Warrewyk”. In the spring of 1484, Anne and Richard were on progress again. On April 20, they heard the disheartening news that their son Edward had died at Middleham on April 9. He had always been a sickly child. Both Anne and Richard were devastated with grief. Their marriage would never be the same after this. Richard now had no direct heir to succeed him. Anne would never be happy or healthy again. Her whereabouts for the rest of the year are unknown. At Christmas she was in London at Westminster. Anne was exhibiting signs of the mysterious illness that would eventually prove fatal. There is speculation regarding what Anne suffered from with the possibilities being tuberculosis or cancer. She had exhibited no signs of illness before late 1484 and she was dead by March 16, 1485 in the Palace of Westminster. It was a rapid decline. She had only been Queen for twenty-two months. It is believed she was buried in Westminster Abbey on the south side of the high altar with all honors due to a queen. Four days after her death, Richard sent an envoy to Portugal to explore the possibility of a marriage with the king’s sister.